Just when Chelsea looked to have sewn up the Premier League title, a massive slip up against Crystal Palace occurred as Sam Allardyce’s side propelled themselves 4 points clear of the relegation zone. The Eagles managed to grab a surprising 2-1 victory over the Blues; the most impressive victory in a host of surprising results all weekend long. Through all ten matches, there were dozens of standout performers and these are the best eleven of them. This is the team of Team of the Week for Gameweek 30 in the Premier League! Enjoy! Of course Crystal Palace were amazing on all fronts in beating Chelsea with an impressive 2-1 victory, but without Wayne Hennessey the Eagles would have never been able to win this match. He came up massive for Wales last week against Ireland and came out massive for his club this time around against league leaders Chelsea as he put in his best performance of the season. In helping to keep Chelsea out, Hennessey made a stunning tally of 10 saves, conceding just 1 goal from 11 shots. Sure some of them were easy saves like David Luiz’s free kick, but others were superb saves like a marvelous stop to keep Hazard out. The Welsh goalkeeper was just absolutely super, also claiming 3 crosses and with that performance probably solidified his place in Allardyce’s XI for the long-term. Rating: 10/10. Danny Simpson has been awesome in Craig Shakespeare’s reign in charge of Leicester City as the Foxes continue to climb back up the table. Even without the steady Wes Morgan along his side in the past two games, Simpson has managed to cope brilliantly and has hardly put a foot wrong since Shakespeare took over. Saturday’s victory over Stoke was impressive in a different way for Simpson, as he assisted both goals in a 2-0 victory. The ball in for Ndidi’s goal held the perfect weight before the Nigerian blasted it in from range but his cross into the box for Vardy’s goal is truly something else. Any defender who can achieve two assists in the same game has to be something special and with the quality of both balls in it was very hard to ignore Simpson for this week’s Team of the Week. The British defender also stuck to his defensive tasks excellently well with 2 tackles, 2 interceptions and 3 clearances, helping Shakespeare’s men keep a clean sheet. Danny Simpson is one of the best right-back’s in the league, has been omitted from England’s national squad for far too long and could now be set to play a massive role in leading the Foxes towards the top ten. Rating: 10/10. Arsenal couldn’t do enough to beat Manchester City nor were they able to stop them from scoring two goals but Shkodran Mustafi still had a very good game. Every other defender for the Gunners was pretty brutal in their performance on Sunday but Mustafi was defensively solid, winning 3 duels in the air and making 3 tackles. He was also fantastic for the Gunners going the other way, contributing to both goals with a goal and an assist to help Arsenal tie 2-2. Without Mustafi’s towering header or pass into the box for Theo Walcott’s goal, Arsenal would not have had any shot at getting anything out of this match. Rating: 9/10. It could be argued that as a centre half, Eric Dier has been nowhere near as good this season for Tottenham Hotspur as he was last season for the club as a defensive midfielder. But on Saturday, the British defender put in what was arguably his best performance of the season as he scored a goal and was excellent in defense, helping lead Spurs to a 2-0 victory away at Turf Moor. Dier had more touches on the ball (99) and passes (79) than any other player on the pitch, highlighting his importance to Spurs in this match. He was also superbly sound in defense, making 10 clearances and winning 6 duels in the air, hardly putting a foot wrong and taming physical forwards like Barnes and Gray. He also popped up with a goal and completed nearly 89% of his passes, elucidating just how good he was in all areas of the game on Saturday. Not that he’s ever been bad, but Eric Dier hasn’t had many standout performance this season. However on his day he is a very good centre-back and was brilliant for Mauricio Pochettino’s side this weekend against the Clarets. Rating: 10/10. 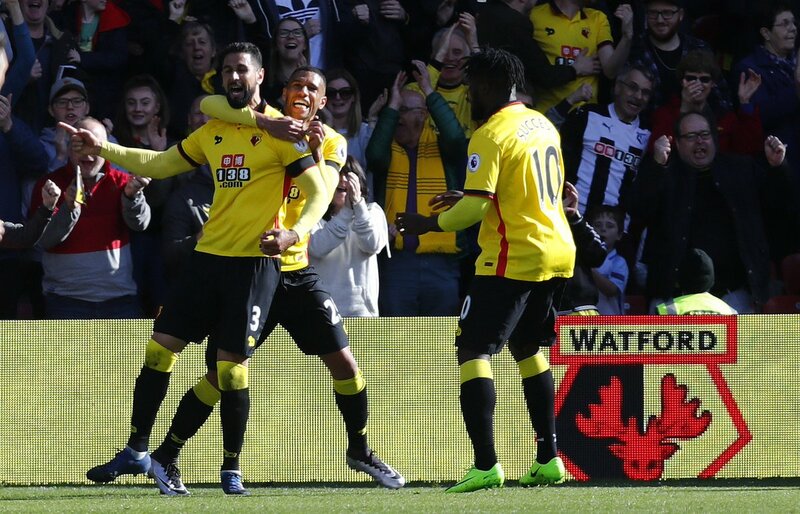 On a losing slump of late, Watford were in desperate need of a win this weekend against Sunderland and thanks to Britos and many others, the Hornets were able to get that much needed win. Britos was the most crucial Watford player of all however as it was his goal that gave Sunderland the win, in addition to his phenomenal performance at the back for Walter Mazzarri’s men. Against the Black Cats, the Uruguayan defender won a stunning total of 9 duels in the air, while also completing 2 tackles and 10 clearances, illustrating just how important he was in helping Watford keep that clean sheet. He was also brilliant in Sunderland’s box, having 3 shots in the match, all of which were on target and one of which found the back of the net. This was Miguel Britos’ best performance of the season and one that earns him a deserved first Team of the Week appearance of the season as well. Rating: 10/10. Thanks to Andy Robertson’s goal and one from his teammate Andrea Ranocchia, Marco Silva has now won or drawn his last 39 home games across all his teams in all competitions, an incredible record that is probably unrivaled all around the world. Robertson was crucial to helping Silva extend that record, putting in an excellent performance at both ends of the pitch. The Scottish fullback had more touches than any Tiger with 81, made 7 defensive actions and scored a fantastic goal. All of those statistics helped to contribute to Hull’s crucial 2-1 win against West Ham United. Robertson struggled to cope with the Premier League under Mike Phelan but has been excellent for Marco Silva’s team as they continue to try and escape relegation. Rating: 9/10. When Wilfred Ndidi first arrived at Leicester City, it looked as though the Nigerian wasn’t going to an immediate impact at all as the Foxes appeared practically destined to go down. But since Craig Shakespeare has come in as manager, Ndidi has flourished and is finally leading Leicester to pastures new where they now look set to finish within the top twelve; a position in the table which seemed beyond out of reach just two months ago. Ndidi was immaculate for the Foxes in midfield against Stoke, bossing the game, scoring an insane goal and dominating defensively. In addition to that thunderous goal from outside the area, the Nigerian midfielder was really superb defensively, winning six duels in the air, making 4 tackles, and completing 5 clearances, helping Leicester keep a clean sheet. 20-year old Wilfred Ndidi might not be the next N’Golo Kante, but with his performances in recent weeks is proving to all how crucial of a player he might be able to go on to be for the Foxes in the future. Rating: 10/10. Filling the boots of Jordan Henderson in midfield, Lucas Leiva proved exactly why he still has such an important role to play in Jurgen Klopp’s side and just how effective he can be in the starting 11 for the Reds. Lucas was Liverpool’s most important defensive minded player against Everton and helped the Reds completely boss the midfield. His most important contribution was in making 9 tackles, 3 interceptions and 3 clearances, hardly putting a foot wrong in defense. He also managed to win a stunning total of 9 duels in the air, an amazing total for anyone especially someone just 5’9! But impressively, Lucas also even popped up with an assist, something that he rarely ever manages to achieve. Lucas Leiva was excellent against Everton and proved exactly why his career at Liverpool is still far from over. Rating: 10/10. Who would have thought that Crystal Palace would beat Antonio Conte’s Chelsea? Maybe the Blues were tired from the international break; maybe they took their foot off the gas, but Crystal Palace still manged to pull off what so few teams in the Premier League have managed to do this season. Wilfried Zaha was pivotal to that fantastic 2-1 victory, as he ran circles around Chelsea’s defense and gave them all sorts of problems, including having a hand in both goals. Just minutes after Fabregas opened the scoring for the Blues, Zaha instantly got them back on level terms with a fantastic bit of skill and goal scoring touch. Minutes after that, he assisted Benteke’s daft chip goal as the Eagles took the lead and were able to hang on for dear life until the end of the game and come out on top. Moreover, despite always trying to pull off intricate attacking passes, Zaha had a pass completion rate of nearly 93% against Chelsea, to which only Tomkins surpassed of Palace players. 5 successful take-on’s, 5 fouls won and 3 impressive tackles will also tell you just how influential the right-winger was in all areas of the game on Saturday. Wilfried Zaha is seriously one of the most underrated footballers in the Premier League and has almost single-handedly led Crystal Palace away from the desperate possibility of relegation that once seemed like a formality for Sam Allardyce’s men. Rating: 10/10. Christian Benteke is so hit and miss! But luckily for Sam Allardyce and Crystal Palace, the Belgian striker was way more hit than miss on Saturday against league leaders Chelsea. Benteke was brilliant against the leaders, doing some leading of his own as he propelled Palace to a 2-1 victory. In addition to having a hand in both goals with one goal and one assist, 11 duels won in the air will also tell you just how much he dominated over Chelsea’s defence and just how much they could not cope with him. The Belgian forward has always been a powerhouse of a striker but proved to be more than just a target man on Saturday with 2 chances created, a brilliant chip goal, 2 clearances and 4 successful take-on’s. It might only be his third Team of the Week appearance of the season, but Christian Benteke certainly deserves the honour as he was crucial in leading his side to a surprising 2-1 victory over Chelsea. Rating: 10/10. Philippe Coutinho hasn’t been been brilliant since returning from injury at the turn of the year, but on Saturday had his best game of 2017 as he led a spirited Liverpool team to a smashing victory. Coutinho was full of energy and liveliness against the Toffees, coming up big in what could prove to be one of their most important wins of the season. The Brazilian was immaculate in scoring a magnificent goal to restore Liverpool’s first half lead before assisting Divock Origi in the 60th to elevate them to a 3-1 win. The wing wizard was so dynamic in attack, creating 3 chances, hitting the target with every one of his shots and completing six take-on’s. Philippe Coutinho has really struggled to hit top form again after that unfortunate injury in November but in the Merseyside derby on Saturday had his best performance of the new year. Rating: 10/10. Philippe Coutinho hasn’t been been brilliant since returning from injury at the turn of the year, but on Saturday had his best game of 2017. The Brazilian winger was like an energizer bunny against the Toffees; full of pace, power, verve and attacking intent, always on the front foot and leading Liverpool to a smashing victory. 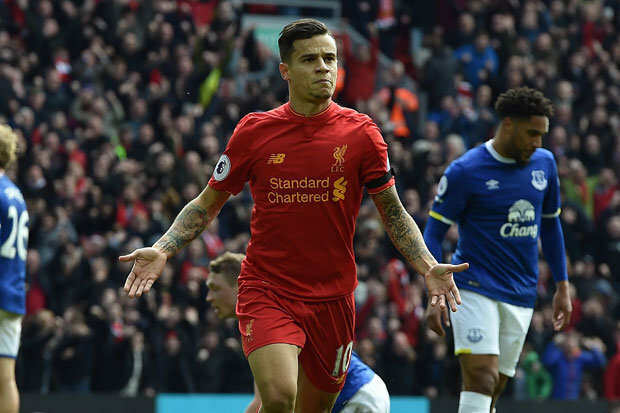 Liverpool scored three goals against Everton on Saturday and Coutinho was involved in two of them, assisting one and scoring the other. The Brazilian winger was just brilliant against Everton was so important to their win that he could not be overlooked as this week’s Player of the Week. Although Marco Silva deserves a mention for securing a surprise 2-1 over West Ham and extending his home unbeaten record to 39 games, Jurgen Klopp has to be this week’s Manager of the Week. Everton were coming into this match in fantastic form. They had only lost 1 Premier League game since the last time they played Liverpool on the 19th of December, highlighting just how fluid they have been all year long so far. But Klopp managed to just completely dominate over the Toffees on Saturday; getting his tactics and team selection completely spot on. The German manager had dropped Lovren for the previous six games in the Premier League but re-introduced him for this match and the Serbian did not let his manager down at all. Lovren was one of the best players on the pitch in fact, completely dominating over Romelu Lukaku, something that hasn’t been said of the Belgian forward at all in 2017. Moreover, coming into this match the loss of Adam Lallana would have been seen as a major downside for the Reds but Klopp just rolled on, introduced Lucas Leiva into the midfield and pushed Can out to the right, another excellent decision. He also got his substitution when Sadio Mane got injured absolutely spot on as Divock Origi would come on and score three minutes later! His man-management and dressing room speeches and tactics just all must have been spot on as well as every single player was really up for this match, constantly winning their 1v1 battles against every Everton player. For his fantastic 3-1 win against his team’s arch rivals Everton, Jurgen Klopp is this week’s Manager of the Week! So there it is! The Premier League’s Team of the Week for Gameweek 30! There is just 8 games left to go now and The Mastermind will be here to cover every single one of them for you. Thanks for reading and see you next time! For more Team of the Week articles go here!